D3, AF-S NIKKOR 14-24mm f/2.8G ED, f/4, 1600 ISO, seventy 30 sec. exposures were made and stacked in Photoshop using Image Statistics, and a stack mode of Maximum. D3, AF-S NIKKOR 14-24mm f/2.8G ED, Exposure: f/4, interval timer set to record 30 sec. exposures over 40 min., totaling 75 images. Several images of foreground shot to merge as HDR. Nikon D3, AF Fisheye-NIKKOR 16mm f/2.8D, Exposure: Interval timer set to capture 30 sec. exposures over 40 min., f/2.8, white balance 2800 degrees Kelvin. Stacked in Photoshop. D3, AF-S NIKKOR 14-24mm f/2.8G ED, f/4, multiple 30 sec. exposures recorded over 45 min., ISO 640. Two cameras simultaneously shot different angles; moonlit foreground. Images stacked in Photoshop with a stack mode of maximum. This image was created at Big Bend National Park in Texas, overlooking the Chisos Mountains. It was shot entirely in camera with no stitching. D3S, AF-S NIKKOR 14-24mm f/2.8G ED, exposed for 2 hours, f/5.6, ISO 200, Matrix metering, auto white balance and in-camera long exposure noise reduction. D4s at f/5.6, ISO 800 and a white balance of 3200°K. I took 20 3-minute shots and stacked them. I scouted this location, called Fifth Avenue, at Arches National Park in the daytime and liked the rock formations, and thought they would make a nice foreground for the night sky. When I checked my Sky Guide iPhone app I saw that Polaris would be right in the center of these formations and would make for nice star trails with the stars circling around the north star. The moon was out and wouldn’t set until 10:30 p.m. that night and lit up some of the rocks on the right. D4S, AF-S NIKKOR 14-24mm f/2.8G ED, f/5.6, ISO 1000 and a white balance of 3200°K. I took 20 3-minute shots and stacked them. This was taken on the North Rim of the Grand Canyon. It took 45 minutes of driving through very rough forest roads to get to this remote location, called Crazy Jug Point. I stayed for the sunset then watched as the night sky started to develop. My tripod was set up right on the edge of the rock and I used the 14-24mm to get as wide a shot as I could to include the Juniper trees in the foreground. I included a bit of the Grand Canyon rim on the right side of the image. Photographing Star Trails is a unique way to capture the night sky in a photograph. 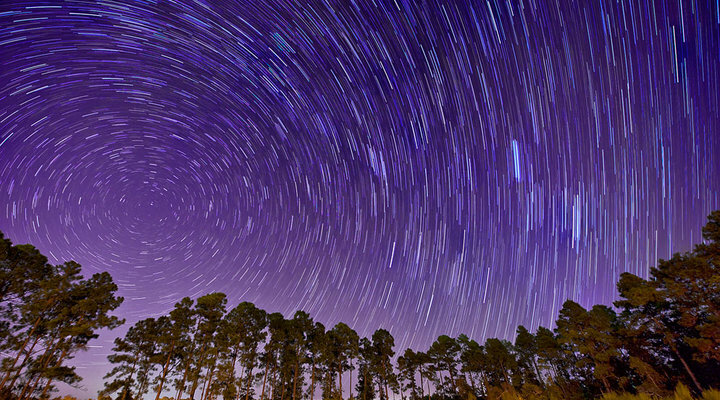 A star trail occurs when you photograph the stars over a long period of time, from minutes to hours. We spoke with two photographers—Deborah Sandidge and Diana Robinson—to find out their techniques and tips for great star trail images. Many photographers use a technique of shooting multiple, shorter length, time exposures and stack them during post-production, using Adobe Photoshop or another program that will allow you to stack multiple files into one photograph. This allows them to produce a more dramatic effect in the final image. Another reason to use shorter exposures is to reduce the occurrence of noise that can show up in an image captured during long exposure shooting. In addition to shooting multiple images and stacking them, using as low an ISO as possible will also limit noise in the final image. Deborah says, “I stack stars because it gives me more flexibility with the outcome of an image.” She creates most of her star trail photographs using an exposure time of 30 seconds; making a number of photographs over the course of three-quarters of an hour or so. She then stacks these images which composites the images using Statistics, in Adobe Photoshop. The fullness of the star trail stacking will be dependent upon whether you spend only a few minutes making exposures or are out shooting all night. If you want star circles, you'll need to be out shooting all night and then stack the images. Where you point the camera in the night sky will determine the shape of the star trails in your final image. For instance, if you center your composition on the North Star (Polaris), you’ll end up with concentric circle star trails. Other compositions can produce arc shaped star trails. In her image of star trails photographed at the Indian River Lagoon (image #3), Deborah positioned the camera facing west to create a “falling star” look. Many of the photographs that are taken of star trails are captured using wide-angle lenses, so interesting “terrestrial” foreground elements can be incorporated into the composition. Some of these foreground subjects will make ideal silhouettes, while others would benefit from a little exposure (natural or man-made). The foreground elements in a composition can be more important than the sky in the background. Diana says she usually reserves very dark locations or places with interesting foregrounds such as Big Bend National Park or Arches National Park for star trail imagery. There are a variety of techniques that can be used to light the foreground for a star trail image, including making exposures at different settings and combining them as an HDR image, light painting the foreground using a flashlight or similar constant light source, and painting with light using a Speedlight. For Speedlight light painting, you manually “pop” the Speedlight's Flash button to fire it, doing so multiple times, to spread the light across the entire area to be illuminated, while the camera’s shutter speed is set to BULB. It is always a good idea to make a few exposures, especially if you’re light painting to fill in the foreground area with visible detail. Its important to keep the light source moving during the exposure so you don’t create hot spots. Sometimes, when you look at your final star trail photographs, you might see other lights crossing the sky in a different direction. These “UFOs” are just the lights from airplanes, helicopters or satellites. Bring a flashlight with you, so you can easily see the camera to change settings while shooting at night. If you’re planning on photographing the sky all night, bring a chair so you’ll be comfortable. Use a compass and star charts to help you determine where to place the camera so you get the type of star trail movement across the photograph that you want. Place the camera on a steady tripod, and use a cable release to “snap” the pictures, to keep from causing vibrations during the long exposures. Include foreground elements in your composition for a more interesting photograph. Use a low ISO to keep noise to a minimum. Use shorter exposures when possible, even though you may end up making more images to stack together, as this will also keep noise to a minimum. Shoot test exposures to see exactly what f/stop and shutter speed (or length of time with the camera set on BULB) will produce a well-exposed image. Use the camera’s histogram to check exposures. Close the eyepiece shutter to keep stray light from entering via eyepiece. Shoot RAW (NEF) so you can easily make adjustments in post-production. Turn OFF the LCD display to conserve battery power. To see more of Deborah Sandidge's photography, visit her website at www.deborahsandidge.com. To see more of Diana Robinson's photography, visit her website at www.dianarobinsonphotography.com.